AWallis, 26 Mar 2014I'm not into huge phones but I will say that after all said and done this is a extremely hands... moreSeriously - this is a small device. You could easily use it with only one hand. Even the Note 3 can be used with one hand, but is a bit easier with two. Epic fail made by HTC. I think there is someone, a kind of saboteur inside HTC's executive board, who is somehow forcing/convincing company to use technology that was their weakest point in previous flagship phone - means 4MP camera. What a waste. Farewell HTC. Well I'm disappointed with all the 2014 smartphone launches tbh,last year's Note 3 & LG G2 are a much better choice if i was to buy now, both offer everything and in some cases more than the 2014 smartphones, even the snapdragon 800 is only slightly slower than the 801, and best thing is the price of these 2 devices are now under £400 for the Note 3 & £300 for the G2. Let's get it right, we all expected HTC m8 to be with better specs especially with camera which is the worst.I will talk about the "4 ultra pixel"which can be the best if there isn't any rival camera around, we have the likes of S5 and Z2 including my favourite G2...these phones will smash the M8 camera with a big margin... The bezel? 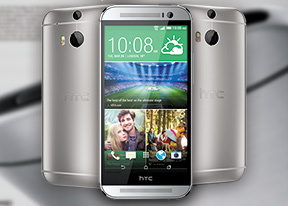 Why leave the space with the lonely logo "HTC"? When actually you have on screen buttons? To tell the truth, the LG G2 has a bigger screen 5.2 and looks smaller and sweeter than these 2014 phones that have 5inch screen each...I own LG G2, I don't see any point of me wasting my hard earned cash for any of these so-called 2014 smart phones..No phone will intimidate the G2 in any way, great camera, great display,multi wallpapets,great processor,I wouldn't want miss best features. what more can one ask for?the HTC one m8 has fewer settings/ effects which makes it boring, they did that in the name of simplicity?booorrring!!! Anonymous, 26 Mar 2014The G2 is clearly better. It's cheaper, has a far better camera, has better endurance when wat... moreThat's a good point!!!! Dunno why people are bashing each brands. Everyone should be glad there's varieties. You got the One for aluminum, S5 for plastic and Z2 for glass, choose your poison! Each phone is equally good! why need 4k recording, if phone cant record it in good bit rate and in good frame rate.! they are still low in use on tv`s! better clear 1080p recording then , ''kinda'' good 4k! AnonD-39775, 26 Mar 2014yes, like apple copied lg prada in 2007 and iphone 5c copied nokia lumia's design an colour ra... moreWho cares? The iPhone was in development for years, and just because one device looks a little like another, it's not copying. Looks at how just about every touchscreen smartphone looked the same after the iPhone came out? LG have been innovating for years, so it's expected that they would accuse another company of copying. Look at their first touchscreen phones, or their phones with video calling. The sad thing is, that they adopted too early and the likes of Apple and Nokia did these much much better. GSMArena you missed the 'traditional loudspeaker test'. I was curious to see how loud the ringer and hands free is. Note:My career tell me go for m8 cus htc devices have a better optomize than sony and samy product..
Primume feel is first reason that i pick up a phone.. I have both xperia z and one and sure i tell u one faar better than z..
Z2is great but sony 's phone almost isnt same that one we see in advertise and in work has a less performance that i expected.. Specially in ui i dont think any phone come to near to sense 6 with most beautiful and charismatic usage. Did HTC copied the iPhone 5S color range and dual tone led or from now on all OEMs will have silver, black and gold phones? AnonD-159252, 26 Mar 2014I love the diversity now days... you want a metal body you have htc you want glass and waterpr... moreMost intelligent comment I have ever read on GSArena. Thank You my good man. Can HTC fire the head of its camera division? what crap do they bring out each year i dont understand a bit. camera has been always the letdown for the one series. What a beautiful looking slick feel good device. Little too big but wow.